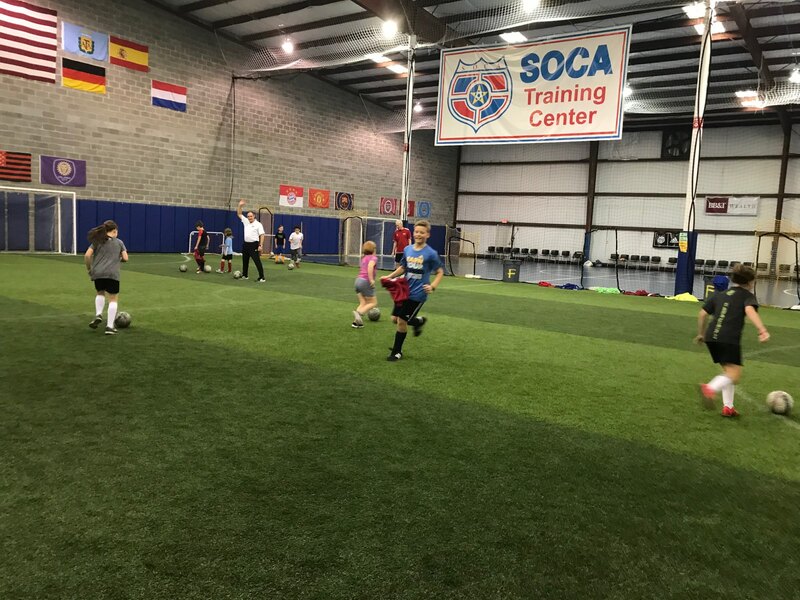 The SOCA Training Center (STC) is dedicated to helping soccer players of all ages and development levels reach their goals within the game of soccer. The first step in that process is the development of fundamental foot skills and proper technique. STC Technical Training Sessions are focused on on building those skills specifically. Sessions are fast paced, fun, and focused on getting your player touching the ball hundreds of times in a short period of time. Building foot skills requires hard work, repetition, and endurance, however these sessions are designed to make that work the most enjoyable hour of the week. Please contact us if you intend to attend a session. Sessions must be booked by 3pm Monday thru Friday. Session Packages are available now through your SOCA account. Sign-up now! Single sessions should be booked directly with the SOCA office, pre-book your session and pay ahead of time or at the session. Remember the first session is free, so don’t hesitate to try out this fast paced and technically driven soccer training. Single sessions can be purchased by contacting the SOCA office and paying by phone or at the session. Want to try it first? Come on out, the first session is free, just e-mail us so we can know your coming. It is important that STC trainees pre-book every session. Sessions are limited to 12 players maximum and may fill. Only those players who confirmed their attendance are guaranteed participation. Weekday Session Sign-up: Please contact SOCA@socaspot.org prior to 3:00 pm the day of session to sign-up. Weekend Session Sign-up: Please contact SOCA@socaspot.org prior to 3:00 pm the Friday prior to the weekend to sign-up. Reservations can not be taken on Saturday and Sunday. Session schedules can be found on the SOCA Calendar. Sessions that are scheduled and planned to proceed will be shown on the SOCA website “Calendar of Events”. Sessions that have been canceled or are full will no longer be visible on the “Calendar of Events”. Current and upcoming Technical Training schedule, below. NOTE: Advanced sessions are advised for current Travel players. Any age-appropriate player may attend any regular session. Important Scheduling Note: The schedule of Technical Training sessions has been established to meet the expected demand. The schedule is subject to change as actual use and demand indicates. We hope to see you at the Training Center! Age Groups: Using US Soccer age groups beginning with the 2018 summer season and continuing through the 2018/2019 soccer year. The session will be removed from the “Calendar of Events”. Friday Night Open Gym is offered in the Winter and Summer Seasons. See the Summer schedule, below! June 14, 21, 28; July 12, 19, 26. 5:00-6:30 for All interested players (U7-U19), players born 2001-2013. Games will be organized in age appropriate groupings among the players present. Summer Open Gym is free to all Technical Training, Summer Academy and all summer camp registrants. Any other players are welcome and can participate for a $10 per night per player fee. A SOCA staff member will be on the premises to monitor and oversee activities. Players will form their own teams and games, there will be no coaching. No pre-registration is required for Open Gym, players may attend as they wish and sign-in once on-site. STC Technical Training Sessions are active and challenging. Please come prepared for athletic activity and ready to play soccer! Indoor soccer shoes and artificial turf cleats are recommended. Shinguards are required for any game play during these sessions. Training sessions may take place on an artificial turf or hard court surface. Players should be prepared to play on both surfaces at every session. Only flat bottom, non-marking shoes are allowed on the hard court surface. Regular soccer cleats may be used on the turf surface, but the shorter studs of an artificial turf cleat is recommended. Soccer balls and other training equipment will be provided, but players are welcome to bring their own soccer ball as well. Players should bring water to all sessions. Session Packages are valid for 6-months from the date of purchase. We encourage the use of all sessions in the time allotted. 6, 12 and 25 Session Packages may be redeemed on a family basis (immediate family members only). All players in the immediate family may use the sessions (players must be listed in the family SOCA account), please specify which player is planning on attending when pre-booking a session. No package refunds are available, all sessions are the responsibility of the player to use in the time period of their package. There are no carry-overs or credits applied to future packages, please use your sessions by the end date of your package. No refunds available, all sessions are the responsibility of the player to use. There are no carry-overs or credits applied to future packages, please use your sessions by the end date of your package. We want you to love your training experience, please come observe a training session as you like, or even jump into a session for free. Just let the SOCA office know ahead of time that you are planning on attending.